From Fargo, North Dakota, Matt is well equipped to provide Wilmington, NC National Speed customers with valuable project planning insights! Matt has an extensive background working with Subaru enthusiasts, along with tons of racing on both the road course and the dragstrip. Just as extensive, Matt’s history of modified cars include a street-focused JDM-front DC2 Integra GS-R, street/track/drag 512whp 2008 Subaru WRX STI, track-focused 345whp EM1 Honda Civic Si powered by a Rotrex C30-94/B18C1, all leading up his most recent & highest performing time attack machine: his absolutely bonkers EK9 Honda Civic, powered by an EFR7670 turbocharged/built K24A, tailored for NASA TT and Gridlife events. From several years of competitive racing with his groups and friends, Matt has picked up a very broad knowledge of all performance vehicles, ranging from Corvettes, to Mustangs, to imports, and even exotics. On top of that, he has experience in fast-growing technology startups and earned a BA in Psychology from MSU! 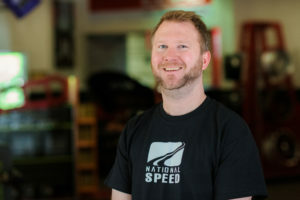 Needless to say, Matt fits right in with the National Speed team, and is enjoying helping our customers realize their dreams day-in and day-out!